Identification of strategies to improve transportation services. This comprehensive and strategic approach benefits the community and project managers by improving communication and collaboration between the agency and the community being served. 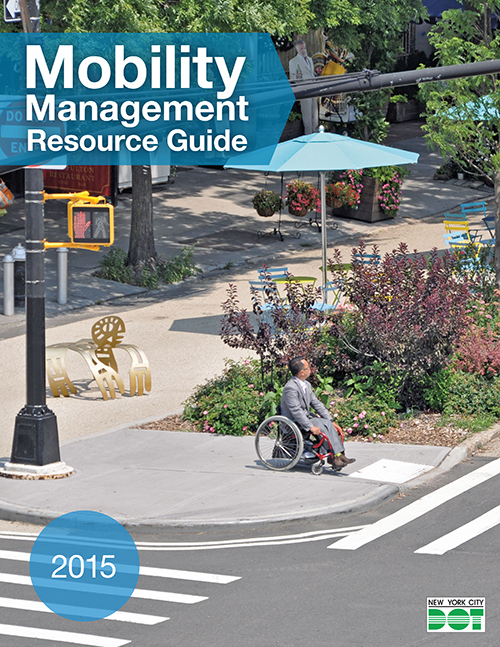 Mobility Management Resource Guide The Resource Guide is a One-Stop-Shop to learn about various programs, services, and existing conditions that could improve mobility and transportation opportunities for people with disabilities and older adults throughout New York City. It can be used by a diverse audience, including community based organizations, city project managers, individuals with disabilities, older adults, caseworkers, and travel trainers. The Mobility Management Conference brings together mobility managers, travel trainers, transit providers, project managers, government officials, and advocates across the region to showcase innovative solutions in addressing mobility needs of people with disabilities, older adults, and low income populations. Previous topics have included partnership strategies, pedestrian infrastructure improvements, and inclusive technology. In addition to our annual in-person conference, the Mobility Management Program hosts a fall teleconference for mobility managers across the New York Metropolitan Transportation Council (NYMTC) region to discuss relevant topics of interest as well as provide updates on local mobility management programs and services. The 2016 Teleconference took place on December 8th, with a focus on innovations in mobility services and mobility management planning. If you're interested in contacting the Mobility Management Program, please email MobilityManagement@dot.nyc.gov or call 212-839-3260.